This notice contains important information relating to advice on the current Intruder Alarm Grades. It is vital to understand the importance of remote signalling from a burglar alarm. An intruder alarm is an alert system. It forms part of an overall security design, with the ultimate goal of protecting life and property. In most systems, the loss of a telephone line or GSM signal means that, when the system is activated, no information will be transmitted remotely to the Central Station or your smart device. Criminals know this and attack the critical alarm transmission and warning devices, as they will have time to carry out their illegal activities. This is why it is so important that you are familiar with the basics of an alarm system. We strongly recommended that you read through this notice carefully. The present general operating standard for intrusion systems is EN I.S. 50131-1:2006. This system is for low level risk of theft. In this scenario, the property would have little security value and the system could be defeated with ease. The break-in would be opportunistic and the intruder requires little or no knowledge of burglar alarms and may have basic tools at his/her disposal to overcome the alarm. These tools may be sourced locally, i.e. garden shed, garage, or just simply left around the property. The protection afforded can vary within a Grade 2. This alarm can still be a low-level alarm. However, depending on the security risk assessment, the system can include higher specification of equipment and installation. Intruders are expected to have a little more knowledge of alarm systems and a general range of tools and portal instruments. This grade is suitable for domestic and low level small commercial premises, florists, fruit and vegetable shops, etc. We are now moving towards properties with reasonable and substantial risk. These properties and assets, due to their value, are of interest to the criminal underworld. The intruders will examine weaknesses in the boundary and building perimeters such as fences, doors, windows, corrugated sheets and cladding, floors, and roofs. The thieves will also have a good knowledge of alarms and electronic systems and will have the necessary tools and equipment to attempt to beat the alarm and other electronic systems. The security assessment must identify the problem areas and anticipate the unexpected. Premises in this category include petrol stations, newsagents with cigarette stock, pharmacies, and businesses holding valuable products and cash. For extremely high-risk properties, where security takes precedence over all other factors, intruders are expected to have the resources to plan the break-in in detail and will have a full range of equipment to overcome the systems. They will have studied the operations of systems and will be able to apply different strategies to conquer the system. An example of a high-risk premises are very high-value investment and stock buildings, national museums, and bullion stores. Installation certificates issued for each alarm system will show details of the alarm including the system grade. 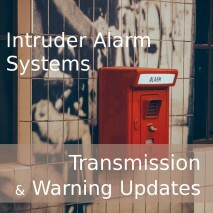 In light of recent criminal activity across the country, it is recommended, as a minimum, that business owners securely install dual-transmission paths into the intruder alarm system. Criminals are targeting the alarm transmission equipment. When they do, signals may not be received remotely from the system, giving intruders time to carry out their unlawful activity. Businesses and organisations need to urgently consider additional smart technologies to give different transmission paths from the Intruder Alarm System, together with an overall assessment of the risks to include a number of preventative factors. This will determine the grade of alarm required. Sovereign Security offers six different communication paths – having more than one path will increase security and response to incidents. In general, it is important that vulnerabilities within the security system are addressed. We understand that the impact of loss is measured in euro but we all need to be pro-active in preventing loss. The cost of safeguarding to deter potential loss situations adds value to your business and is less stressful than investigating how criminals breached the premises without any response. Security is no longer one dimensional; it must anticipate and address the consequences of today’s lawless activity in Ireland. Businesses should review and identify risks to limit the incident loss and be alert to in-house security awareness. If you require further advice or assistance, please do not hesitate to contact us and be assured of our confidentiality. Copyright © 2016 Sovereign Security Ltd.